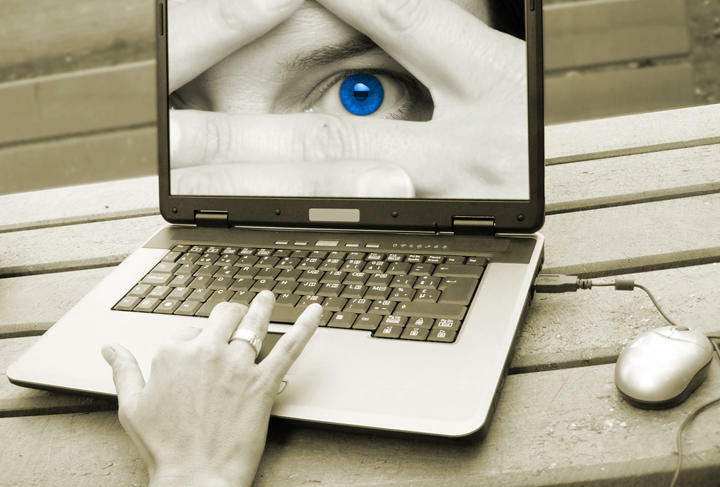 To Web-savvy users, the idea of privacy may seem quaint. Even so, there's something unsettling about seeing indisputable proof that governments all over the world are trying to surveil users or influence data. But that's just what Google delivered in its sixth bi-annual Transparency Report, released this week. The company revealed an increase in the government requests for access to content from Google services over 2012. 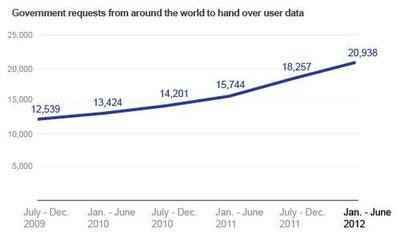 The company started releasing this data in 2009, making it crystal clear that the number of requests have gone up year after year since then. From January to June of this year alone, there were 20,938 government inquiries covering 34,614 accounts. "Government surveillance is on the rise," wrote Dorothy Chou, senior policy analyst, via Google blog post. "[G]overnment demands for user data have increased steadily since we first launched the Transparency Report." In addition, government requests for removal of data, which had stayed somewhat level, also saw an increase in the last six months. 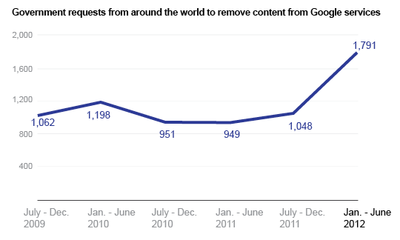 Google received 1,791 requests to remove 17,746 specific items this year. That's not to say that Google is playing ball with all of this. Over the last two years, the company has been less amenable to requests for content removal. For petitions originating in the U.S., where Google is headquartered, it has complied with less than 50 percent. Requests for user data, however, is another thing. The company complies with 90 percent of these types of inquiries. Most people have nothing to fear, says the U.S. Department of Homeland Security. After all, it's not like the government's going to go busting into people's email accounts… that is, unless it's part of an investigation. If that's the case, all bets are off. "If the government is investigating a crime, it has a lot of authority to review people's emails," says Stewart Baker, former assistant secretary at the Department of Homeland Security.